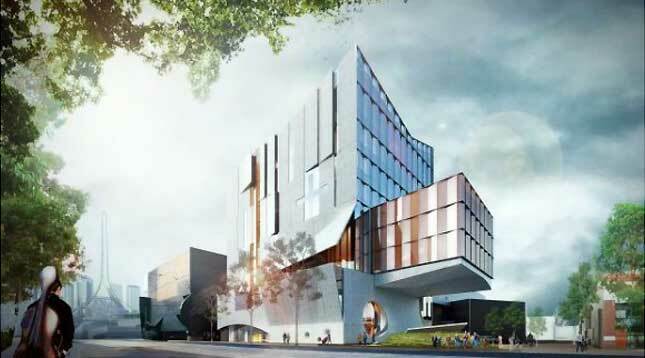 The Melbourne Conservatorium of Music, University of Melbourne’s eight-floor $105 million project will be located at 33 Sturt Street, Southbank. The new Conservatorium building forms part of an ongoing redevelopment of the University of Melbourne’s Southbank campus. The project has a vision of balancing the singular concentration music students require, in conjunction with encouraging collaboration with other music students. John Wardle Architects won the design competition and will work with landscape architects Aspect Studios in creating a vibrant and exciting environment for students in the heart of Melbourne’s art culture precinct. The project will bring together the VCA and MCM which will include a 443-seat cantilevering auditorium, a 200-seat ground floor studio and a range of rehearsal studios and spaces for teaching, performing, recording and research. Slattery is proud to be involved as the cost management consultants for this exciting and innovative project.